Wayne Township and its 27 square miles of rolling, lake darted country was not always known as Wayne. It was not always part of Passaic County. Long before the coming of the White Man, it was inhabited by quiet, industrious Indians who farmed the rich meadowlands and hunted and fished in the woods and streams. Their legacy to us lies in the many place names of Indian origin, which have given their identity to our countryside. In 1694, the English in New York City sent a young surveyor, miner and land speculator named Arent Schuyler on a secret mission to North Jersey and beyond to check on a rumor that the French were trying to rouse the Indians to rebel against the English. Schuyler found the rumor to be false, but discovered a rich fertile valley where the Indians grew a variety of crops. Schuyler reported his findings to the English in New York City; then convinced seven prominent men to invest in the purchase of the land he referred to as the Pompton Valley. These men were Major Anthony Brockholst, Samuel Bayard, Samuel Berry, Hendrick and David Mandeville, George Ryerson and John Mead. The seven chose Schuyler to be negotiator with the Indians for the Indian Rights to the area. Samual Bayard was chosen to deal with the East Jersey Company who had the land rights from the King of England. Approximately 5,000 acres were purchased for 250 pounds and wampum (shells the size and shape of a cigarette used for barter). The purchase of the land was concluded on November 11, 1695. The area now known as Wayne Township then became part of New Barbadoes in Essex County. In 1710, the same area became part of Saddle River Township in Bergen County. Arent Schuyler moved to Belleville, New Jersey, where his servant brought him a bit of metal that unearthed a copper mine. In 1837, the residents of Wayne found themselves in Manchester Township in the newly named Passaic County. 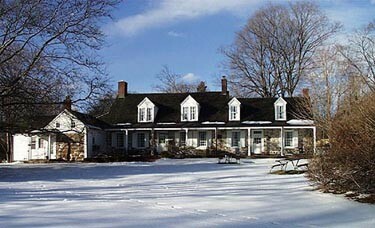 Finally, on April 12, 1847 the first Wayne Township organization meeting was held at the Henry Casey House on the Paterson Hamburg Turnpike. The first mayor, called the Chairman of the Township Committee until 1962, was William S. Hogencamp. The Citizens voted to name the town for the dashing hero of the Revolution, General Anthony Wayne. Throughout the 18th and 19th Centuries, Wayne Township was a peaceful farming community. It had its share of grist, saw and cider mills, as well as blacksmith shops. Family wills and documents show evidence of local slavery on the farmsteads. Gradual abolition of slavery in New Jersey began in 1804, but the practice continued under the name of “apprenticeship” until the federal government abolished it in 1865 by the Thirteenth Amendment to the United States Constitution. There were few local industries. Some iron was mined, and brick yards made use of rich deposits of clay. Gunpowder was made by the firm of Laflin and Rand on Ryerson Avenue. The Morris Canal ran through the southwestern part of Wayne carrying produce to market and coal from Pennsylvania. The canal was replaced by the railroad at the end of the 19th Century. One railroad car could carry more than a canal boat and be used the year round. Season freezing of the canal limited its use. The railroad brought vacationers, as well as produce, in the early 20th century. In the summer hordes of people from Manhattan and Brooklyn came to live in the summer bungalows and enjoy the beautiful rivers. World War II made tremendous change to Wayne. Summer bungalows were converted to year round living residences to accommodate the people moving here to work in war related industries. Following the war, farmland was converted to residential living. The growth of Wayne resulted in a new form of government in the 1960's. A mayor, council, business administrator type of government was instituted in 1962. An antiquated postal system was modernized by an energetic leadership of the local Chamber of Commerce. Modern highways have made Wayne Township a virtual crossroad in North Jersey. Routes 23, 46 and 80 and the Paterson Hamburg Turnpike have made Wayne easily accessed for business and homes. Several national firms have located here. Education instruction began in Wayne in a dugout school near Brandon Avenue. Legend says Anthony Wayne sheltered his horse here during the Revolution. Today Wayne's excellent schools number nine elementary, three middle and two senior high schools in addition to several private schools for all ages. The first religious house of worship was the Preakness Reformed Church, although now there are many in number and denomination. Wayne has six historic houses that are on the State and National Registers: Schuyler-Colfax House, Dey Mansion, Van Riper-Hopper House, Mead-Van Duyne House, Van Saun House and Ryerson House. In addition, there are twenty historically significant sites. Over the years Wayne has had nationally known individuals as residents: namely Albert Payson Terhune, the famous writer of collie dog books; Cecil DeMille, the movie mogul; and LeGrand Parish, the inventor of the Westinghouse air brake, a coupling device, and fire brick boxes. Another national celebrity was the Preakness horse. Purchased in 1868 by Milton Holbrook Sandford, owner of the Preakness Stables at the corner of Valley Road and Preakness Avenue, for $4,000. On his maiden start Preakness was entered into the "Dinner Plate Stakes" at the new Pimlico race Track in Maryland. Preakness won the first race on October 25th, 1870. In 1873 the Maryland Jockey Club started a new racing classic for three year olds and named it "The Preakness" in honor of the first horse to win a race at Pimlico. Today Wayne offers many things for people of all ages; nursery schools, excellent elementary and secondary schools, churches for all faiths, an excellent modern library, convenient shopping centers, swimming pools, lakes and organized recreation for all to provide quality living for today's citizens. Wayne's Little League team won the 1970 World Series.